These were not the words I planned to write today. I have the post sitting in my folder waiting to be edited and polished and that is where it will stay for another day because sometimes we go through the hard and the difficult so that compassion becomes the grace that we give out in return. By my very nature I am a contender. I was born fighting for life, premature by 3 months and then contracting whooping cough before my first month of life. The very beginning of my days were bathed in the prayers of a man of God who knew how to contend. I still feel his prayers, they are a shroud over my days. His deep love for God was a catalyst for my journey to the Cross. 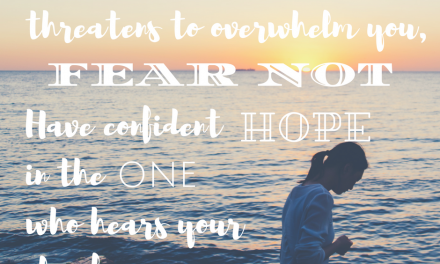 But contenders don’t often know when to back down, friends… and we wear out, like Moses did on the mountain, so that we need to have our hands lifted and our hearts encouraged by the faithful. Yet, if we don’t ask, if we keep wearing the armor and keep showing up to fight, no one will know we are needing the compassion that petitioning with others provides. When that happens, we stretch ourselves thin and eventually, we find ourselves losing steam on the journey. Obedience is a call to yield our will. It takes faith to step into the submission of one who is called; it takes humility to admit that we are not enough. As we bend in the weight of our burdens and our brokenness, we learn lessons that perhaps are meant to be shared…Even if they break us more. When the day cracks the finely crafted shell which holds you in, you begin to spill out what is inside. What will spill out of you today friends, if you are bumped beyond your preparation? Is it life? Is it grace? Is it peace? I wasn’t prepared for the firestorm of emotions that concluded my day. And it sometimes seems that no matter how hard we prepare, no matter how precisely we put on the armor, there may still be an opening that allows an arrow to breeze by leaving a mark. And flesh wounds are painful, though they only scratch the surface they have the potential to leave a scar. Our scars are the stories of our battles. They are reminders of the loss of the battle but the victory of the war. Because, friends, there is going to be a victory for us… no matter how many small battles we lose. The Lord has been leading me to rest over the last few months. I am not good at rest and release, because I want to do. Yet, no matter how difficult it is to walk in that obedience, it follows the pattern of release that He reminds us to practice. 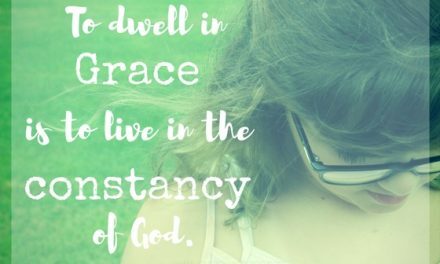 Being still and letting Him be God should be easier than it feels, but when you have spent so much time contending, it feels like defeat when the barrier we erect has crumbles. But…sometimes these walls have to fall for us to feel His embrace. Sometimes moments of grace are the breaking that sheds burdens and heals hearts. I don’t like when I am caught by surprise and fail to spill grace, friends. I feel like a fraud in those moments. But here, in these sacred spaces, His promise echoes deeper, vibrating in sounds that can only be felt. His mercy in our brokenness puts Him in proximity to catch us as we fall into His will. Today, I found grace moments in the promise of tears as seeds and mercy through confession and repentance. I realized that though I responded to something not so major, it was because I hadn’t brought the all the little things that built up over the days before. As we go to His Word, this promise that when we sow in tears, we will reap in joy is an forever truth He speaks to us over and over. (Ps. 126:5) Failure is not the end, but the beginning of our journey in grace. As we draw close to Him with contrite hearts, he will be near to us with the upholding grace of mercy, salvation, and restoration. Make grace for every moment be the prayer of the contrite heart to spill. 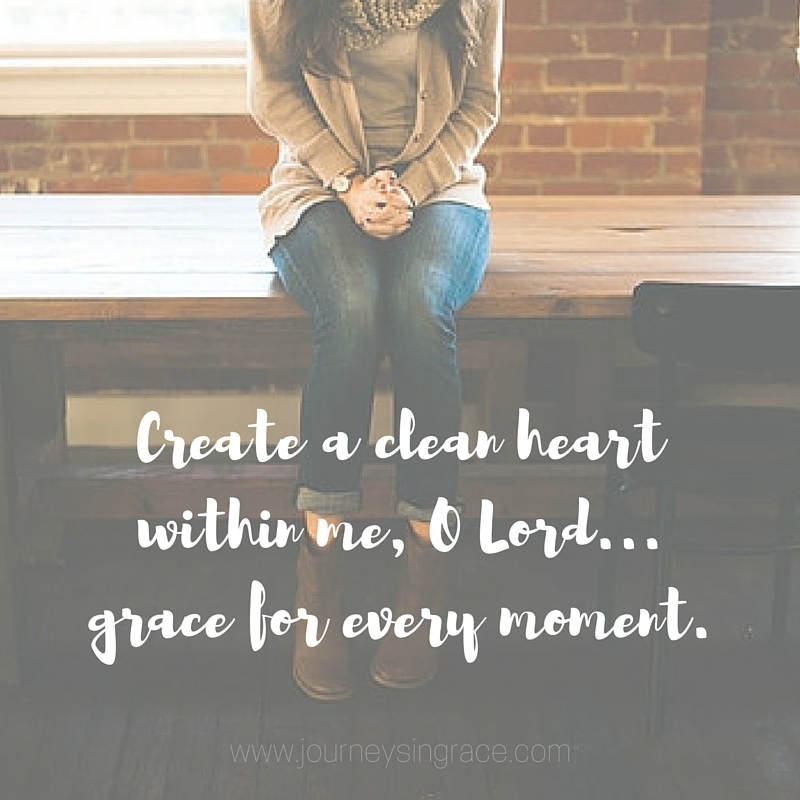 Create a clean heart within me, O Lord…grace for every moment. Maybe you need to be reminded of these words from Psalm 51, today. Perhaps you need to know it is ok to let walls fall and let His compassion complete you like I did. Know that I am praying for each heart that is feeling a crack in the armor surrounding your soul or the crushing weight of burdens not lightened by grace. May you be encouraged that as you fall, you are always caught by grace. May you be reminded that when we are broken He is near. May you be built up as you bend low and seek His restoration today. Make us to hear joy and gladness and be satisfied ; let the broken rejoice. 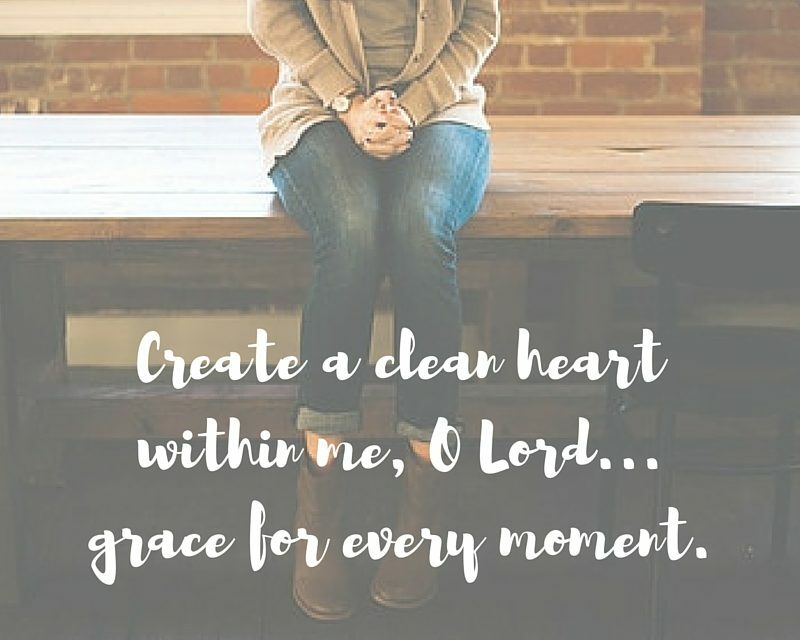 Create in us a clean heart, O God, and renew a right, persevering, and steadfast spirit within. Restore to us the joy of Your salvation and uphold us with your Spirit; Open our mouths to spill words of praise. Let the sacrifice acceptable to your, a broken spirit; a broken and contrite hearts, be the grace we spill in our moments. 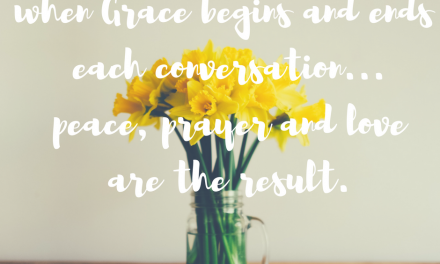 Praying for grace to spill in your moments. Dawn, I am grateful for this question which you have shared >>> “What will spill out of you today friends, if you are bumped beyond your preparation?” You ask these hard questions not with a sense of condemnation but with grace and an awareness that we so need our God even more than we think. 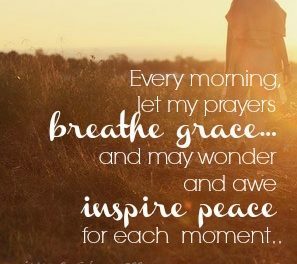 May He prepare me today so that I will spill out His grace and mercy today! Blessings! My walls came crashing down a few years ago. He became real to me. The scars I have from that time still hurt, but they have given me a ministry!